Oplev det vestlige Anatoliens vigtigste højdepunkter på et 5-dages eventyr fra Istanbul. Turen fokuserer på en række antikke græske og romerske ruiner samt flere moderne monumenter fra 1. verdenskrig. Besøg vigtige landemærker, såsom ANZAC-mindepladsen, Troys ruiner, Byzantiumporten, Hadrianens tempel og mere . Turen er inklusive logi, nogle måltider, transport og en flyvning fra Izmir til Istanbul. We enjoyed the history of these various sites in Turkey. We had our own private tour in Gallipoli. The drive was just too long from Istanbul to Gallipoli. We spent around 4 hours touring the museum and the site and took the ferry to Canukkale. 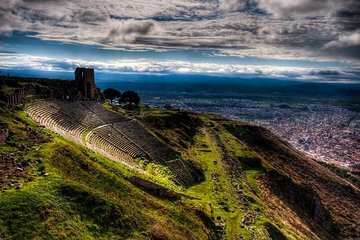 Stayed there overnight then started at Troy and Pergamon for another private tour. We enjoyed the historical sites and all our guides were very knowledgeable and proud of their history. They drove us to Kusadashi and we stayed there for 3 days spending time in Pamukkale and Ephesus. My 2 girlfriends and I were treated to a 5-day private tour in the most comfortable spacious mini passenger van. Our guide Ercan Yuvaz was very knowledgeable about the ancient historical sites and were patient and accomodating to our needs. Highly recommended for those who prefer small group tour.